It’s hard not to fall in love with Great Bay the first time you see it. New Hampshire doesn’t have a lot of direct seacoast, but it does have a near-pristine tidal estuary. In the mid-20th century an enormous grass roots effort went into protecting not only the estuary itself, but the surrounding land that supports and sustains the fragile ecosystem. With more than 1000 acres, the Great Bay NWR is an important habitat for migrating birds including black ducks and bald eagles which both overwinter on the Bay. Osprey, coopers and red-tailed hawks and kestrels are just some of the other raptors who make their homes here (if you’re lucky you may spy a northern harrier, too). Some of the mini-ecosystems found within the preserve include both fresh and saltwater marshes, woodland, ponds, swamps and fields. There are also extensive mud flats that provide ample feeding ground for wading shorebirds. Underpinning the entire ecosystem is a now healthy oyster population which was brought back from the brink by the cooperation of several conservation groups. Oyster beds help create a healthy environment for fish populations and the oysters themselves provide vital water filtration. 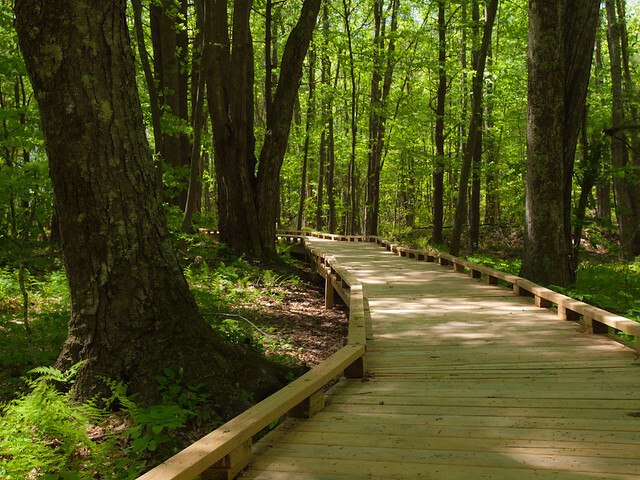 The trail system at Great Bay NWR is a small one, leaving most of the area untouched by daily human traffic. What makes this preserve different is that one trail is wheelchair accessible. That’s Peverly Pond trail which takes you out to the upper section of the pond and features a roomy bird blind. The elevated path takes you through mixed pine and oak forest with dense undergrowth. There you’ll find Indian cucumber, sensitive fern, Canada mayflower, goldthread, star flower and a lot of poison ivy, so please keep to the boardwalk. The other trail is the Ferry Way trail which begins as a paved path and brings you to the edge of Little Bay itself where there is a viewpoint looking out over the water. You’ll see beaver ponds and an old apple orchard as you pass through to vibrant fields. 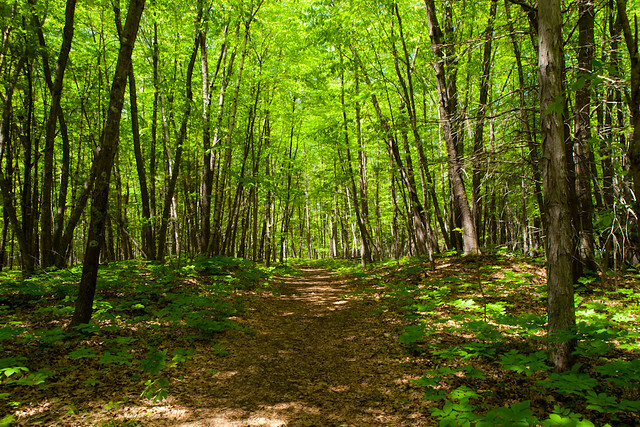 Woodland trails are lined by red and white oaks, many maples and shag bark hickory. Wildflowers like geranium and asters mix with lush fern beds and sarsaparilla. Take exit 1 off Route 16 or Spaulding Turnpike and turn onto Pease Blvd. heading into Pease International Tradeport. Go through one stoplight to a stop sign and turn right on Arboretum Drive. Follow refuge signs for 3 miles to refuge parking lot, office, restroom and trails. You can find more information here, a black and white map only here, a Ferry Way trail only guide here and a map and trail guide here.